“The laziest man I ever met put popcorn in his pancakes so they would turn over by themselves,” W.C. Fields was once quoted as saying. Although Fields was likely speaking figuratively (and was possibly drunk at the time) the quote has sparked the interest of many a food hacker. Are popcorn pancakes that flip on their own really possible? The answer is yes, kind of. While it is possible to flip a pancake with popcorn kernels in the microwave, the pancake will overcook in the process. For those who are actually looking to save time by making a self-flipping edible pancake for breakfast, I suggest you don’t get too excited. If you want to eat a pancake that has flipped itself with popcorn, it definitely won’t taste very good. 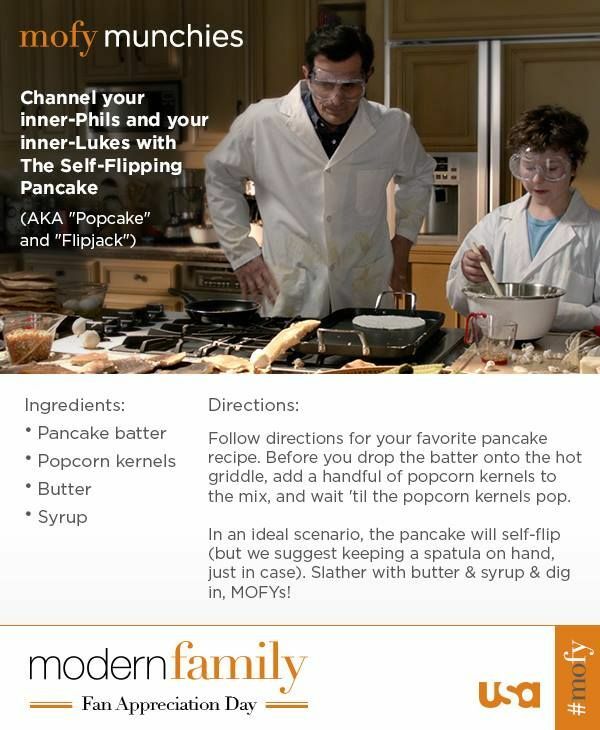 Modern Family fans might feel compelled to share that Luke and Phil once succeeded in making a “flipjack” popcorn pancake on the stove—but we must remember that TV isn’t real. Ultimately, the only way to apply enough constant and intense heat to popcorn kernels that are covered in pancake batter (with consistently successful results) is to cook in the microwave. Drop a handful of popcorn kernels on a microwave-safe plate and then pour pancake batter over the kernels. Microwave on high for 2-3 minutes, and eventually, the popcorn kernels will crown, flipping the pancake in the process. However, a pancake that has been nuked for 3 minutes is quite the opposite of a soft and fluffy flapjack. To make a popcorn pancake you’d actually want to eat, pop a fresh batch of popcorn and immediately roughly chop the popcorn, reserving a few handfuls. Place 1 cup crushed popcorn in a large bowl and toss with 3 tablespoons brown sugar and 2 teaspoons cinnamon. Prep a batch of your go-to pancake batter, subbing in ⅓ cup cornmeal for flour. Heat a nonstick pan over medium and grease with a bit of oil. Drop ¼ cup pancake batter onto the pan, then cover the top of the pancake with crushed popcorn mixture. When the pancake looks golden brown on the underside, flip it and cook for another 2 minutes.